GWArc is thrilled to receive a $5,000 grant from the Foundation for MetroWest for our School to Work Transitions Program. This award is especially meaningful as it was based on the recommendation of local high school students in the Foundation for MetroWest's Youth in Philanthropy Program. GWArc's School to Work Transitions Program is run in collaboration with Waltham High School to support students with developmental disabilities and learning challenges as they transition from high school to work and productive adult life in the community. Click here to learn more about our School to Work Transitions Program. 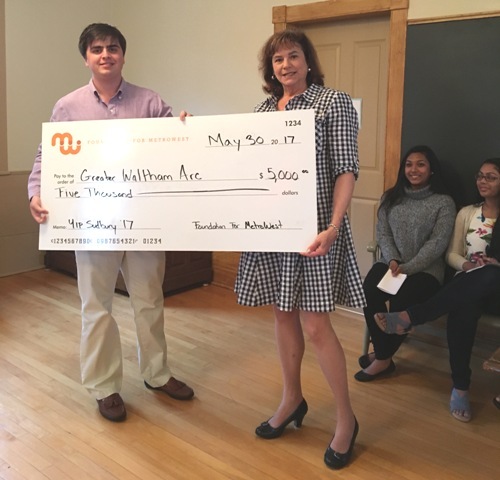 Alec Bornstein of Westwood High School, a participant in Foundation for MetroWest's Youth in Philanthropy Program, presents a check to Roslynn Rubin, Ed.D, GWArc CEO at an awards presentation on May 30. Established in 1995, the Foundation for MetroWest is the only community foundation serving the 33 cities and towns in the region. We promote philanthropy in the region, help donors maximize the impact of their local giving, serve as a resource for local nonprofits and enhance the quality of life for all our residents. Since inception, the Foundation has granted $14 million to charitable organizations and currently stewards more than $18 million in charitable assets for current needs and future impact. To learn more, please visit www.foundationformetrowest.org or call 508-647-2260.